Max has well over 10 years in the Automobile industry. Max always puts customers first and making his customer's car buying experience ever so enjoyable. Max's goals are to build relationships and earn your business. Max stands by his quote “We finance your future, not your past.” Max is an exceptional family man who brings excitement and passion from his home life to his office life, you will always enjoy his professionalism. Max has been living in the Tampa bay area for over 25 years. So please come visit Max for your next Automobile needs. 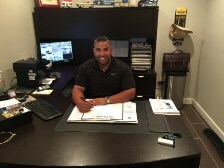 With more than two decades of operational and management experience, Kevin Medeiros has developed a sharp eye for helping individuals with their car buying needs. Providing customers with the tools and knowledge necessary in making a wise pre-owned vehicle purchase, this has been a trait acquired from years of experience at large dealerships. We strive in our ability to offer quality vehicles that is competitively priced significantly below retail.